Advantages: Process of building well described; plenty of photographs; interesting colour schemes; useful weathering techniques; good list of reference books; includes colour chart. This book is an excellent guide to modelling the Sturmvogel. First we have a brief overview of Me 262 variants and then a very good chapter about the available kits and accessories – quite a lot of them, I hadn’t realised there were so many. Comments on the base kits used are given in each chapter, too. The first build is by Brett at advanced level, using Revell’s 1/72 scale kit of the Me 262B-1a and turning it into a detailed A-1a with CMK and Wurmcastings aftermarket sets. There’s quite a lot of work here, but nothing that isn’t fully described and shown in photographs so anyone beyond the absolute beginner stage will be able to follow it on their own model. Next is a detailed analysis of the Tamiya 1/48 scale kits, with an Intermediate build by Brett showing how to refurbish a built model and give it a new paint scheme. Then Robert contributes an Advanced build of the same kit, using Cutting Edge and Aires sets to superdetail the cockpit and improve other areas. 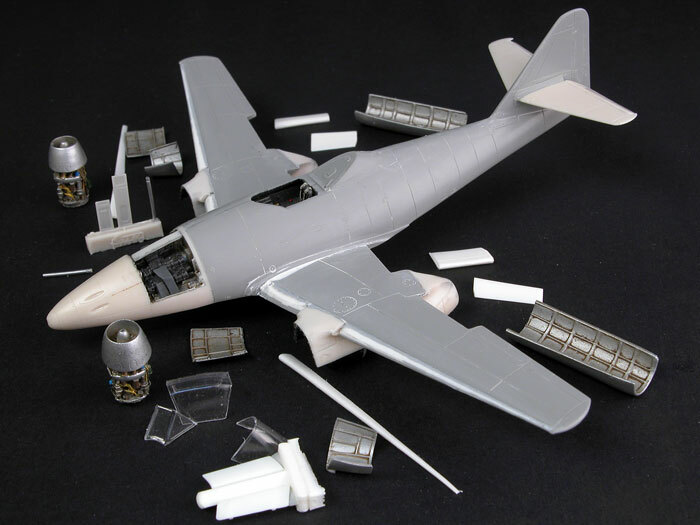 The third “new build” is at Master level by Brett, converting the Tamiya kit into the A-1a/U3 reconnaissance version with CMK and Cutting Edge conversion sets plus Cutting Edge detail sets. It’s followed by a look at the Dragon 1/48 kits, and then a Master level build of the Dragon B-1a/U1 night fighter by Brett in which he shows how to install the CMK jet engine as well as Cutting Edge control surfaces and wheels and the Ultracast pilot’s seat, also adding an FM Opel Blitz fuel tanker and Tamiya Kubelwagen with figures to produce an airstrip scene. The final build is by Steve Palffy at Advanced level, commenting on the Hasegawa 1/32 kit and using a Grand Phoenix cockpit and Contact Resin wheels to detail it but principally showing how to achieve a realistic natural metal finish in duplicating a captured 262 that had only a few painted areas. Although I’ve not repeated myself for each chapter, they all come with good descriptions of how to do the work and excellent step-by-step photographs as well as comments on colour schemes and markings. To end the book there’s a page of colour swatches showing typical camouflage effects. Highly recommended to anyone thinking of building a 262 – even if you don’t feel like tackling the Master level work you can still get an enormous amount of help here!